Can Solar Energy Reboot The U.S. Economy? Can Solar Power Reboot The U.S. Economy? The economic benefits of solar energy are an ongoing conversation in Washington. In July 2015, President Obama announced an initiative to expand solar technology and employment opportunities to Americans in low and middle-income communities. In April 2014, the White House hosted a National Community Solar Summit to address a nationwide effort to jumpstart solar power projects for local homes, businesses, and schools. Clearly, the Obama administration is on board with solar energy. But is the move toward renewable energy — specifically solar — actually good for America? Here's a look at how solar power can become a sustainable sector of the U.S. economy. Solar is the fastest growing source of renewable energy in the U.S. Between 2016 and 2020, the solar workforce is expected to double, and investment is expected to grow by $40 billion. "Today the U.S. solar industry has more employees than tech giants Google, Apple, Facebook and Twitter combined," said Rhone Resch, the president and chief executive officer of the Solar Energy Industries Association, in a statement. According to The Solar Foundation, a U.S. nonprofit that researches the impact of solar energy, a solar panel installer earns an average of $23.63 an hour — a rate that's comparable to wages paid to skilled electricians and plumbers. To meet the industry's increasing demand for skilled laborers, Obama announced plans to implement training programs at community colleges so that 50,000 workers can enter the industry workforce by 2020. 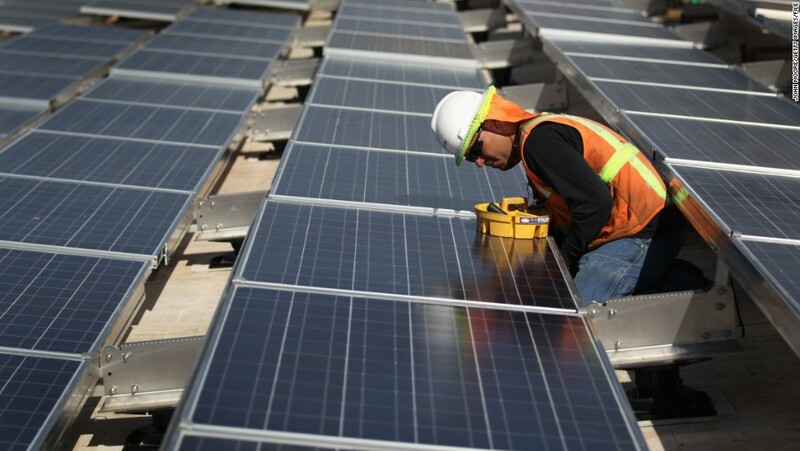 "From a jobs perspective, the real selling point is that these are inherently local jobs that pay above the average national wage with an opportunity for mobility without significant amounts of training or education,” wrote Andrea Luecke, the executive director of the Solar Foundation, in an email to CityLab. When you create your own power, you take less power from the grid — which means you pay less for your monthly utility bills. In 2014, installing 5 kilowatts of panels on a home costs $26,000. However, once panels are installed, they could pay themselves off in 10 to 20 years. Plus, if you're reluctant to invest in solar for the long run, solar installation companies also give property owners the option to lease a solar system. According to a study by the Lawrence Berkeley National Laboratory (LBNL), rooftop solar systems increase a home's resale value. Based on results in California, every 1-kilowatt increase in a home's solar system added $5,911 to its resale value. The industry also opens up new business opportunities for installing, planning, and manufacturing solar power systems. For example, solar can attract equipment manufacturers to rural areas that desperately need to retain a working population. The majority of electricity is produced by large-scale power plants. Once the energy is converted, it gets transported hundreds of miles to its destination. Once local businesses, schools, and homes set up their own renewable energy systems, they won't have to rely on the grid as their only source of power in case of emergency. Air pollution from power plants leads to severe health problems, including premature deaths and asthma attacks in children. According to the EPA, cutting carbon pollution from power plants could save the U.S. $55 to $93 billion a year in climate and health costs. Why The Surge In Solar? When the solar industry took root in the 2000s, the high cost of manufacturing and installation kept solar panels out of reach for most businesses and residences. But in 2006, the government established the federal investment tax credit (ITC). This tax credit offered a 30% reduction in income tax to businesses and homeowners who installed a solar system on their properties. The ITC was so successful that it was extended to the end of 2015 and renewed to 2022. Now, the average solar power system costs 67% less than it did in 2010. Thanks to the tax credit and significant drop in solar panel prices, more solar panels were installed between 2012 and 2014 than in the previous 30 years combined. While state and federal governments play a crucial role in developing the solar sector, private companies are also confident in the industry's continued growth. According to a White House press release, Walmart committed to doubling the number of onsite solar energy projects at their U.S. stores by 2020. Apple and Yahoo agreed to power their new headquarters with 100% renewable energy. Clif Bar asked its key supply chain partners to use 50% green power by 2020. Taylor Farms, IKEA, and Kaiser Permanente have also agreed to increase solar usage at their facilities. Meanwhile, financial institutions like Citi and Goldman Sachs have committed to large-scale investments in solar energy programs. In December 2015, Google launched Project Sunroof to help homeowners figure out how many solar panels they could fit on their roofs. "As the largest corporate procurer of renewable power in the world, and one of the largest corporate investors in both utility scale and residential solar, we’re doing our part to support solar not only because it provides clean, renewable power but also because it makes great business sense,” said Rick Needham, Director of Energy and Sustainability at Google. What's In Store For Solar? The U.S. solar industry has seen unprecedented growth over the last decade. But its continued expansion boils down to economics. For solar to compete with other energy sectors, electricity generation from solar panels has to cost less than electricity generation from non-renewable sources like oil, coal, and natural gas. "Solar is surging. Renewable energy deployment is on track to transform our world, helping to lessen our reliance on coal and other polluting fossil fuels,” said Hilda L. Solis, Board of Los Angeles County Chair and former U.S. Labor Secretary, in a 2015 Solar Foundation press release. Through continued government subsidies, increased private investment, decreased production and installation costs, and decreased barriers to permitting, the solar sector is poised to become a strong contender against non-renewable energy sources in America. "The Obama administration has announced initiatives to make solar a sustainable sector of the U.S. economy. But is the move toward renewable energy — specifically solar — actually good for America?"